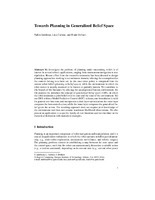 Towards Planning in Generalized Belief Space - Download this document for free, or read online. Document in PDF available to download. We investigate the problem of planning under uncertainty, which is of interest in several robotic applications, ranging from autonomous navigation to manipulation. Recent effort from the research community has been devoted to designplanning approaches working in a continuous domain, relaxing the assumption thatthe controls belong to a finite set. In this case robot policy is computed from the current robot belief planning in belief space, while the environment in which therobot moves is usually assumed to be known or partially known. We contribute tothis branch of the literature by relaxing the assumption of known environment; forthis purpose we introduce the concept ofgeneralized belief spaceGBS, in whichthe robot maintains a joint belief over its state and the state of the environment. Weuse GBS within a Model Predictive Control MPC scheme; our formulation is valid for general cost functions and incorporates a dual-layer optimization: the outer layercomputes the best control action, while the inner layer computes the generalized belief given the action. The resulting approach does not require prior knowledge ofthe environment and does not assume maximum likelihood observations. We also present an application to a specific family of cost functions and we elucidate on the theoretical derivation with numerical examples.